If you think of Florida, a lot of people think of alligators. A lot of people will also probably think about the Florida Gators, but right now we are talking about the American alligator. Before man set foot in Florida, it was already inhabited by alligators. There are probably more than 1 million alligators in Florida, most of them live in South Florida, but also a lot can be found in the Orlando area. A lot of lakes, swamps, ponds and canals can have at least one or more alligators in them. Be careful if you walk your dog or start swimming somewhere, be sure it is free of alligators. If in a neighborhood dogs start to go missing, it is likely to be an alligator on a feeding frenzy. If you drive past canals and lakes, take a good look around and you might see one or more enjoying the heat. A large American alligator weighs about 800 pounds (360kg) and is about 13 feet (4 meters) in length, but they can grow over 1000 pounds (450kg) and 14.5 feet (4,5 meters). They have an average of 75 teeth. If you visit Florida, be sure to visit The Everglades National Park to see a lot of them. 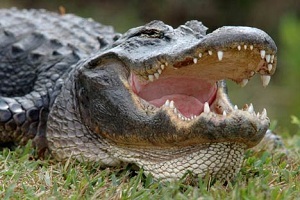 Alligators can also be found in the Orlando area, in the wild and in captivity. Gatorland is a 110-acre theme park and wildlife preserve, combining "Old Florida" charm with exciting new exhibits and entertainment. The park opened as a roadside attraction in 1949. Today, it provides affordable-priced family fun with thousands of alligators, crocodiles, an aviary, breeding marsh with observation tower, petting zoo, nature walk, educational wildlife programs, Gatorland award-winning gift shop, Florida's best train-ride, restaurant, Gator Gully Splash Park and one-of-a-kind reptilian shows including the Gator Wrestlin' Show, Gator Jumparoo and the Up-close Encounters Show. 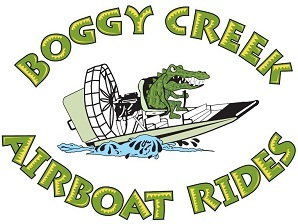 And, don't miss the world's largest collection of giant white alligators in the new White Gator Swamp and the all new Screamin' Gator Zip Line featuring over 1,200 feet of high flying thrills, five intense zip lines and a massive 150 ft. suspension bridge. 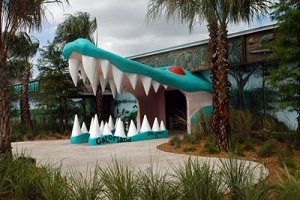 You should definitely visit Gatorland, when you are in Orlando, you won't be dissapointed. Try some fried gator nuggets while you're at it! One of the things you really got to do when you are in Florida, is to go on an airboat tour and look for alligators in the wild! Sure you can do this in The Everglades, but if you are just staying in Orlando, why don't you spend a morning, afternoon or evening closer to your accommodation? Boggy Creek has got two locations, on is at the south end of Lake Tohopekaliga, the other one on the north end of East Lake Tohopekaliga. Check their website for the specific tours, hours and address for the 2nd location. Personally I've had a better encounter in the colder months. In warmer months it is better to take a night tour, or come early in the morning. Check out our video on YouTube. Congo River Golf has got miniature golf courses, "so what has that got to do with alligators", you say? 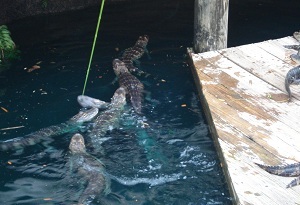 Well, at CRG they have about 25 young alligators which you can feed hotdog pieces, with the use of a fishing rod. You will be amazed how much power these little ones already have got. Some won't let go of the hotdog and even start to make their death rolls. There has been some controversy over CRG and their alligators. There has been a petition telling they use metal hooks. Maybe they did in the past, but I've only seen them using plastic sort of clothes pegs. Next to that, the ponds they live in would be too small. But isn't this true for all animals held in captivity? Fact remains that these alligators have been fed by humans, so they can never be released into the wild, that would be far too dangerous. There is also a Congo River Golf on 5901 International Drive. 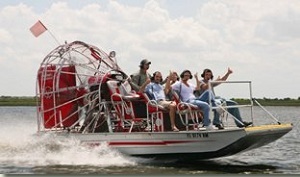 Just like Boggy Creek, Spirit of the Swamp operates on Lake Tohopekaliga, but only uses smaller, more personal airboats. These carry up to 6 people. Boggy Creek also has smaller boats, but also bigger boats to carry more passengers. Next to that, Spirit of the Swamp uses intercoms, so you can communicate with the captain to ask questions or ask him to stop to make some pictures or video. These boats make a lot of noise, so intercoms really do come in handy. I haven't had an experience with Spirit of the Swamp yet, so I can't tell you which one to pick, Boggy or Spirit. Check both websites and decide which one you want to check out. Boggy has got lower rates probably because of the bigger boats. For tours and rates, check out the Spirit of the Swamp website. Spirit of the Swam only works with advance reservations.